A report from the Ministry of Education, Youth and Sport revealed that students in Grade 3 struggled with writing proficiency in Khmer with a 65% failure rate at writing proper sentences. In the same report, students’ vocabulary was also reported to be limited while their scores in the area of dictation were also below 40%. With these alarming statistics as the backdrop, InSTEDD iLab Southeast Asia, supported by The Swedish Program for ICT in Developing Regions (SPIDER), in partnership with KAPE, developed Sor Se Khmer, a new app that is focused on improving students’ Khmer writing, vocabulary and speech. To find out more about the application, we sat down with the apps’ developers, Mouy Leng (ML) and App Project Coodinator, Chhorn Chhayyuth (CC). What are some of the key features of the application? CC: The key feature of the app is to help the students to write. We cover the fundamentals of Khmer typography in the Khmer alphabet. As you may know, the Khmer alphabet is the longest alphabet in the world so we try to teach the students how to write each letter. This ranges from the vowels to the consonants, the dependent vowels, the independent vowels as well as the subscript or the superscript. ML: Specifically, the application teaches them through 3 different methods. Firstly, we teach them how to write the letters by showing them a photograph of the letter and asking them to copy it. Secondly, students can listen to the audio of each letter and write it and the last method follows the concept of word recognition. This means that we show them a picture of something and they have to write the matching word in Khmer. The app is also said to be able to increase the students vocabulary, how does it do that? CC: According to our research with the Ministry, teachers in schools have a lack of exercises available to increase students’ vocabulary. By creating an app, we are able to put more words into the database and allow students to have access to a wider variety of exercises and a wider range of words, thereby enabling them to study at their own time and pace. What was the process of developing the application like? ML: It started during the iCamp workshop which was a one-day rapid prototyping workshop. We developed a prototype application and then we went to do field testing with grade 1 to grade 3 students as well as their teachers, checking on the apps’ usability, understandability and ease of use. After the testing was done, we re-grouped and improved the app according to the feedback we received. What was the biggest change you made to the app after the feedback? CC: A lot of the feedback we received was regarding the apps interactivity so we looked at how to make each activity more interactive and engaging for the children. We tried to make the app more functional and usable for children by updating the user interface too. How was the content for the app built up? ML: We follow a certain textbook to get the base for our materials and then we design an accompanying image that is child friendly. CC: Yeap, we take the content from various textbooks and we make that digital by uploading all the videos, the pictures, the words into a server. From there, we convert it into an APK file that can be downloaded and used by the schools. What are some features you hope to improve/add on the app? CC: On of the biggest challenges we face is with regards to the typography and the strokes for the Khmer Language. They are hard to detect on the screen as character recognition technology has not really been developed in that area. This would be something that we will definitely look to improve. In terms of adding features, we’re looking at ways to gamify the app to entertain the children while they are studying. Some ideas we have include uploading a black and white picture which the students will be able to paint. Hopefully this little entertainment will inspire them to learn more. But right now, because of time constraints, we are working on making sure the recognition system is improved before we look at these additions. ML: Another feature we’ll look at in the future is an interactive voice that will prompt students to answer a question. We hope to make it touch sensitive as well – that the voice will interact with students when they touch the screen. 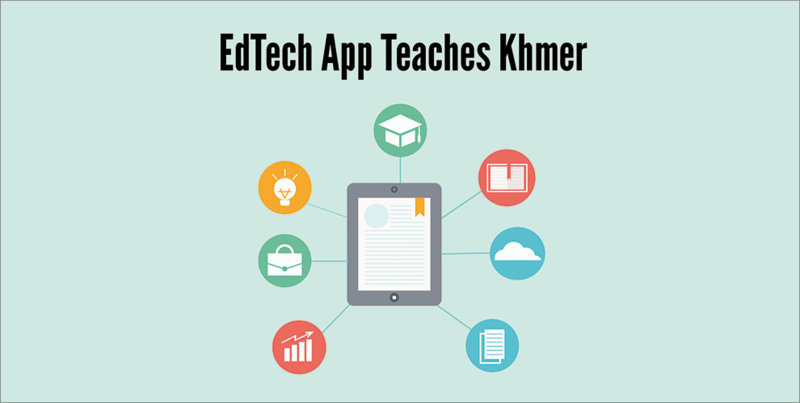 What do you hope the impact of the app will be on education in Cambodia? CC: We’re in the midst of developing assessments that will gauge a child’s progress after using our app so I guess that would be one way we could judge the impact of the app. We’re also working to release the app on the play store and we’re going to embark on a pilot programme with schools in the second part of the year as well. Under this programme, the schools would be equipped with tablets which come with the app and students can visit the school library to make use of it. By releasing it on the play store, we hope that students will be able to have access to these exercises at home and on-the-go so that they can learn and practice at their own pace. Hopefully, this will help close the gap with regards to the lack of learning materials. How do you see the EdTech scene developing in the Kingdom? CC: With more platforms like our app and the education ministry harnessing technology, it will help to improve the quality of teaching and learning in Cambodia because it addresses the lack of materials that teachers have. Furthermore, if you develop a quality platform, students will be able to engage in self-learning without the need of a teacher as well. It’s really great to see how technology is improving content delivery to Cambodian students today. With such improvements, Geeks in Cambodia is really confident that students will get the quality education they deserve. If all goes well, the Sor Se Khmer app will be available on the market before the second semester of the school year. Stay locked to Geeks in Cambodia for the Kingdom’s latest tech updates.